Abstract: The motivation for this work was the reduction of losses due to vortex formation at the entrance of a wave driven seawater pump. Measurements in a wave tank using a prototype had shown a 10% ¡ncrease in the pumping efficiency when a trumpet like shape was added to the intake. This lead us to search for an inlake that would reduce or completely suppress vortex formation. 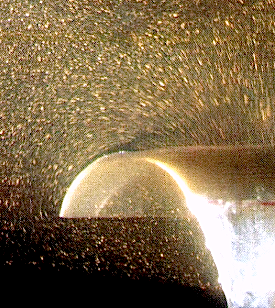 In this experiment a piston produces an oscil1ating flow inside a partly submerged duct. At the end of the duct four different shapes were tested. 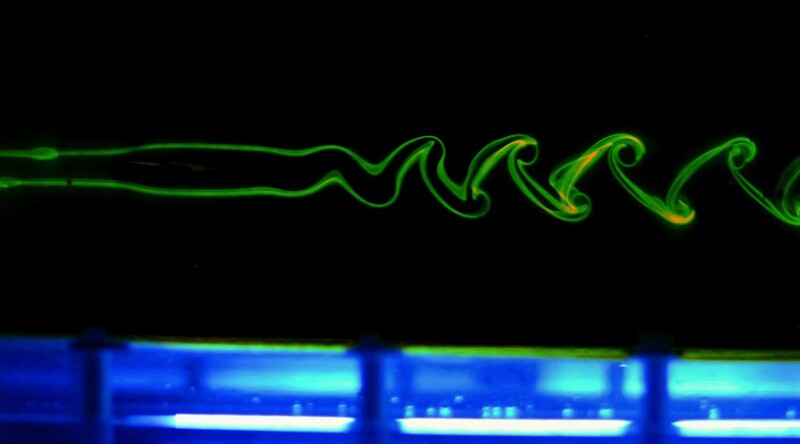 The flow field was visualized either by using silver paint in the water or by injecting diluted fluorescent water paint just outside the diffuser. In both cases the flow was illuminated wilh a light sheet. A wide range of frequencies and amplitudes of oscil1alion of the piston. controlled electronically, were studied.